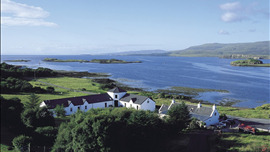 Sheltered by a small brae to the north, and surrounded by lochs on three sides, Ullinish is dramatic Skye personified. This historic dwelling has played host to Highland visitors for more than three centuries (James Boswell and Samuel Johnson stayed here during their celebrated tour of the Western Isles) and today's guests are equally captivated by its charms. Current incumbents, Brian and Pam Howard, have sympathetically refurbished the interior, and it now boasts a peaceful lounge as well as an intimate candlelit dining room. The kitchen aims high and makes impressive use of locally landed seafood and game from the hills for a concise modern menu. To begin, a 'tasting' of local hand-dived scallops involves four different ideas including a tartare with caviar and apple. Main courses could offer a choice of dry-aged beef with Gendrynoch watercress, parsnip purée, mushroom fricassee and Madeira sauce or turbot poached in red wine with spinach, duck 'en crepinette' and a vinaigrette of smoked bacon and ketchup. Hot beetroot soufflé with clove ice cream and beetroot 'caviar' is a daring dessert, while West Highland cheeses come with pear and tamarind chutney. Under new head Chef Calum Montgomery this this former run of the mill restaurant has been transformed into one of the best eating establishments on Skye. Focussing on fresh local ingredients the food served here is inventive, colorful and bursting with flavour. The twice dived Scallops are to die for and locally sourced venison is simply sublime. Securing 3 AA Rosettes in his first few months in charge this chef is a prime Michelin star candidate.